- ein Vulkan verändert die Welt. Über einen Zeitraum von mehreren tausend Jahren entstehen zwischen dem heutigen Griechenland und den Küstenregionen Kleinasiens eigenständige Kleinkulturen auf den Kykladeninseln, geprägt von Rohstoffhandel und Schifffahrt. Meilensteine der Entwicklung liegen vor allem im Schiffbau. So basiert ein erster Tauschhandel vor 4500 Jahren auf geruderten «Langbooten» aus Zedernholz der levantinischen Küstenregion. Tausend Jahre später entwickelt sich in der kykladischen Inselwelt eine Handels- und Seefahrerkultur, deren Ursprung auf seetüchtige segelnde Galeeren aus der Levante und Zypern zurückzuführen ist. Die zentrale Ringinsel Santorin mit ihrem einzigartigen Naturhafen wird zum Handels- und Kulturzentrum der Ägäis. Im kulturellen Mittelpunkt dieser Seefahrerkultur steht die Frau als Priesterin und Göttin und verkörpert den Glauben an Inkarnation. Die minoische «Palast-Kultur» eines paradiesischen Kretas ist mit der kykladischen Seefahrerkultur eng verknüpft und wird durch eine wohlhabende theokratische Gesellschaft von Göttinnen, Priesterinnen, Priestern, Prinzen, Aristokraten, Kapitänen und Admiralen getragen. Der Zerfall dieser Kultur, die Verwüstung der kykladischen Inselwelt und die Zerstörung vieler Siedlungen und Paläste auf Kreta wird durch die katastrophale Eruption des Vulkans von Santorin vor 3628 Jahren ausgelöst. 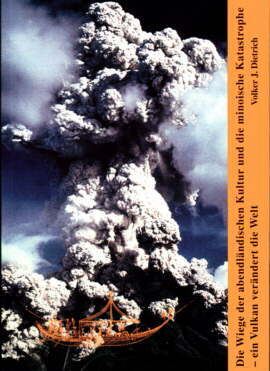 Starke Erdbeben und durch die gewaltige Vulkaneruption erzeugte Riesenwellen (Tsunamis) zerstörten nicht nur ganz Santorin, sondern auch alle Nachbarinseln sowie alle Schiffe und Siedlungen entlang der Küsten der südlichen Ägäis und Kretas. Teile der Aristokratie und der Seefahrer flüchten auf den schützenden Peloponnes und schaffen eine neue, auf militärischen Grundsätzen beruhende Ordnung und Herrschaft. Als «Mykener» kehren sie nach Kreta zurück und bauen mit den Zurückgebliebenen die Paläste wieder auf. Von weiteren grossen Erdbeben erschüttert bricht nach zwei Jahrhunderten die «mykenische Palastadministration» zusammen. Grosse Erdbeben sind schliesslich auch die Ursache für den Zerfall des glanz-vollen mykenischen Reichs sowie die Zerstörung Trojas zwischen 1150 und 1200 v.Chr. ; der trojanische Krieg bleibt damit eine Legende. The Neolithic Cycladic and Minoan civilizations rose by seafaring and trade over a long time span of several thousand years in the Aegean islands, Crete, and in the surrounding coastal regions of the Aegean Sea. Milestones in the development are seen in the construction of sea-going ships. During the Kero-Syros culture approx. 2600 - 2400 B.C., the beginning of exchange trading was introduced by the «longboats» which were built from tall cedar trees in Lebanon in the pre-Phoenician cities of Ugarit and Byblos, and were rowed by large crews mainly along the Anatolian coast. One thousand years later, the first sailing galleys from the Levante coast and Cyprus (originally Egyptian constructions) were able to withstand the open sea and heavy weather and extensive trading began throughout the Eastern Mediterranean, Cyprus, Rhode, Crete, and the Aegean islands. The volcanic ring island Santorini (at that time «Kallisti», the «most beautiful») became the central trading point of the Aegean Sea due to its geographic position and secure shelter within the inner Caldera lake. Commerce brought wealth and good reputation to the isle. Nowhere but in a centre of commerce and seafaring such artistic creativity could have flourished. The Minoan way of life, architecture and religion was devoted to natural harmony and beauty. The frescos found in the harbour city of «Akrotiri» impressively visualise the lifestyle of the inhabitants: graceful young women wearing colourful costumes, youths enjoying music and sports, exotic plants and animals as well as exquisite dishes document a lively lifestyle on Kallisti island. Parallel to Santorini, the agricultural paradise island Crete profited the most of trading its rich surplus in wine, oil, wood, resin, fruits, and grain against resources, metals, goods, and technology from Anatolia, Levante and Egypt. Within a few centuries (approx. from 2000 - 1628 B.C.) it grew rich and powerful with an aristocratic society of merchants, nobles, priests, princes, captains, admirals and living goddesses. But this idyllic Cycladic and Minoan way of life in Santorini did not last for long. Strong earthquakes shook the entire island and surrounding areas. There was no explanation for the sudden emergence of these natural phenomena. Volcanic eruptions were unknown in the whole Aegean region, since volcanic activity had been totally absent for the last 17 400 years. Evacuation of the islanders started before the major volcanic eruption and the excavations of the town of Akrotiri showed clearly the picture of an abandoned «ghost town». The destination of many refugees must have been the neighbouring Cycladic islands. Richer merchants, aristocrats and priests however, either went back to their homelands in Crete or to the settlements Argos, Tiryns and Mycene in the safe «new world» of the Argolis. According to tree-ring chronology and 14C isotopic age determinations, the volcanic eruption began in 1628 BC. During four major eruptive phases, which lasted only a few weeks or months, 50 to 75 km³ of pyroclastic material was emitted in plinian-type eruptions. Ash and pumice columns probably reached stratospheric heights of 30 to 40 km. These clouds drifted east and south-eastward covering most of the eastern Mediterranean. Subsequently, the magma deficit of approx. 25 km³ volume at shallow crustal level underneath Santorini led to a collapse of the caldera from sea-level to more than 600 m depth. Ashflows, glowing avalanches, landslides and the collaps of the caldera must have released huge tsunami waves, not only in Santorini and neighbouring areas but also in the entire Aegean region. The effect of this large volcanic eruption can be seen as a major impact on the Minoan-Cycladic civilization, devastating the Cycladic islands, the northern coast of Crete, the Dodekanese, Rhodes and flooding all coastal areas of the Aegean Sea. With this catastrophe, as well as with subsequent major earthquakes, the Minoan civilization in Crete and definitely in the Cycladic islands came to an end. However, in the Argolis, the Cycladic and Minoan emigrants formed a new and powerfulcivilization, the «Mycene civilization», based on military principles and monumental customs, which lasted for another four hundred years. The origin of the polytheistic Greek religion seems to fall into this era as the result of the apocalyptic dimesion of such a natural disaster. In contrast to their Minoan ancestors, the Myceneans never again developed a thalassocratic civilization. Major trading activities, spreading their well known potteries over the Peloponese and the Greek mainland went by land routes or by pre-Phoenician and Cypriot seafarers, which carried on the maritime known-how dominating progressively the Aegean seas and soon the entire Mediterranean. Again, the reason this «golden Mycenean era» came to an end is that major earthquakes occurred in the Peloponese, not a long lasting war against Troy, as glorified philosophically in Homer's Iliad. At this time period, the destruction of Troy seems to have been also the result of a major earthquake, followed by large fires and devastation. Today, such a natural catastrophe in the close vicinity of the «North Anatolian Fault System» is a very plausible explanation and most probably recurred several times during the entire history of this famous city.